David Devlin Harbin, born to Dr. Charles C Harbin and Patricia Harbin in Louisville, Kentucky, on September 23, 1947, passed away on August 28, 2018. His death was the result of an accident while hiking with his son, Patrick in the Jemez Wilderness Mountains of New Mexico. 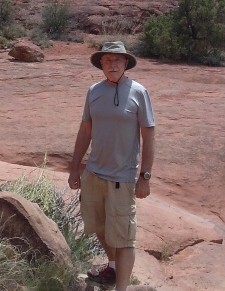 His life’s passion was exploring the lovely, remote regions of New Mexico, the state he loved. David graduated from Del Norte High School in Albuquerque, the University of New Mexico with a Bachelor of Science Degree and earned a Masters of Arts Degree. During the Vietnam War David enlisted in the United States Marine Corps attaining the rank of Corporal and Squad Leader. He was deployed to Vietnam with the Second Battalion Fifth Marine Regiment. He was seriously wounded at the Battle of Hue City in 1968 while serving as a squad leader with Hotel Company... He required months of rehabilitation for a full recovery and carried a bullet from his wounds for the remainder of his life. CPL Harbin received the Silver Star, the third highest award for valor for his bravery during the Battle of Hue City. On February 4, 1968 with exceptional courage he ran across an open fire swept area, delivering a heavy volume of fire to the enemy. He fearlessly moved through many rooms of the building where the enemy was entrenched to clear it of all resistance. In addition to a Silver Star and Two Purple Hearts, CPL Harbin was awarded the Combat Action Ribbon, Presidential Unit Citation (two awards), Vietnam Service Medal, Vietnam Campaign Medal, Vietnamese Cross of Gallantry, and Good Conduct Medal. He was affectionately nicknamed "Barney" by his Marine buddies due to his propensity for carrying a rifle magazine in his top pocket. David knew the historical sites of New Mexico like no other. He acted as a guide as he, family and friends explored ghost towns like Albamarle (near Bland), Loma Parda, Fort Union, Civil War sites such as the Battle of Glorieta Pass and Val Verde. His knowledge of New Mexico points of interest and history was superior. Those who knew him considered David to be the best guide and historian in the state. David is survived by his loving wife, Bonnie Quintana Harbin, and their son, Patrick Devlin Harbin born in 1998, his four sisters and two brothers, and numerous nieces and nephews. He was a great husband and father and brother. His biggest joy was spending time with his family, enjoying the simple things such as pizza and a movie and a night at home together with their dog, Corky and takeout orders from “Steak in the Rough.” Their adventures also included many road trips in the splendor of the beautiful New Mexico outdoors. Their favorites were camping, boating, fishing and hiking and green chile cheeseburgers. He was a loving and courageous man. He was fair to all he met and knew. He served and loved his country and family well. He lived with us all in good faith and with truth and high honor. His zest for life was unsurpassed. He will be missed.